Tis the season for all things pumpkin, is it not? We’ve got lattes & muffins & chilis & ice cream & butters & millions of pinterest boards dedicated to all things pumpkin. It’s amazing, but slightly overwhelming. Cans of pumpkin & pumpkin pie spice greet us in the grocery stores, pushing themselves onto us, begging us to make something, anything, pumpkin flavored. 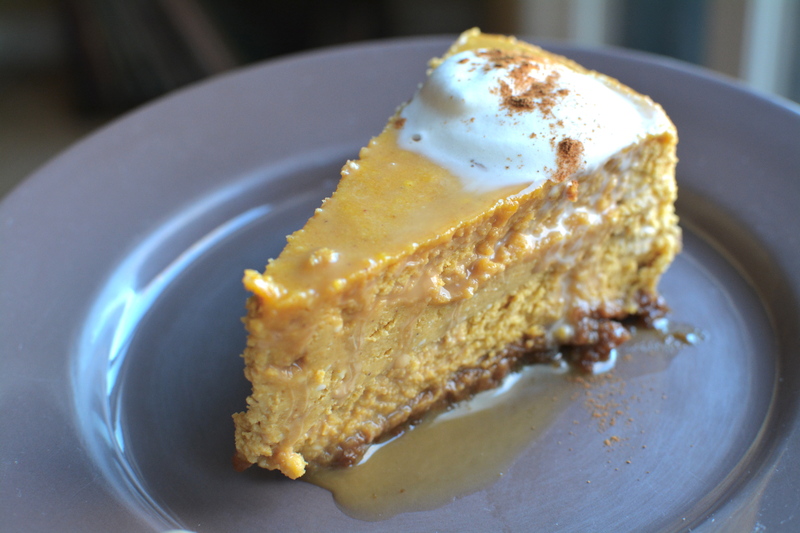 I figured since we’ve got about a month left of the pumpkin craze (before we start talking peppermint & gingerbread), I’d go ahead and make a pumpkin dessert. Cheesecake, to be exact. Topped with lots of salty caramel & Gourmet Garden Lightly Dried Ginger. As GG’s resident blogger [see more on Featured Bytes], I have the opportunity every month to create recipes using one featured herb. I’m very lucky to work with such an amazing team who lets me share & experiment with delicious recipes & herbs. For this cheesecake, I followed & adapted a recipe from One Upon a Chef, considering this was my first time attempting a cheesecake all by myself. While I definitely consider myself more a savory chef, I can say this cheesecake is certainly makin’ the case for bytes the baker. 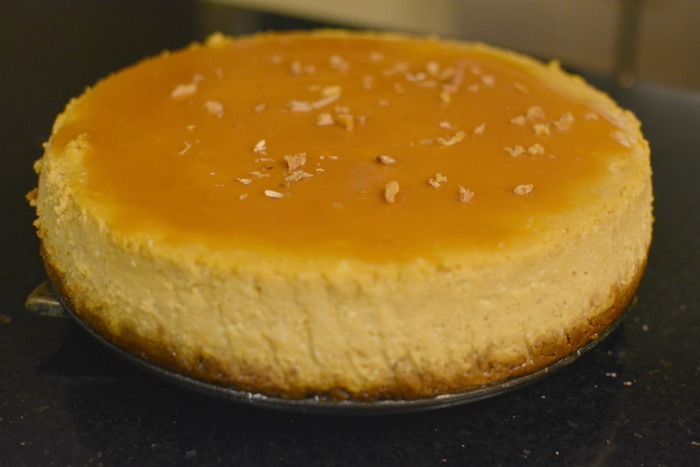 While certainly time consuming, cheesecake is quite easy to prepare. Sure, you have to let it rest and cool down for many hours (chilled overnight, in this case), but with patience, comes creamy and rich cheesecake. You might need to make for thanksgiving. It’s amazing. It might be my dinner if I don’t stop soon. That’s it. No dinner for me. Too much cheesecake. Seriously. Place the mixing bowl (and whisk) in the freezer for 15 minutes to chill. Then, remove them and place the mixing bowl in the bottom of a stand mixer fitted with a whisk attachment. Add all ingredients to the bowl and beat the mixture until soft peaks appear or when the cream mounds softly when dropped from a spoon. Serve immediately. Store in the fridge for 2-3 days. Preheat the oven to 325 degrees. Wrap a 9-inch springform pan twice with heavy duty aluminum foil. Pull the foil all the way up to the sides so water from the water bath does not seep inside. Spray the bottom and sides of the pan with cooking spray. Pulse the gingersnap cookies, sugar and lightly dried ginger in a food processor fitted with a metal blade until finely ground. Add the butter and pulse a few times to combine. Add the crumbs to the pan and using a glass or measuring cup, press the crumbs into an even layer. Bake until fragrant and set, about 15 minutes (mine took about 20). Cool on a wire rack. Bring 3 quarts of water (or enough water to fill a large roasting pan) to a simmer [this is used for the water bath]. In a small saucepan, stir together the pumpkin, sugar, cinnamon, nutmeg, cloves, ginger and salt. Over medium heat, bring the mixture to a sputter, stirring constantly. Reduce the heat to medium low, stirring constantly, and cook for 5 minutes until thick, bronzed and shiny. Scrape the mixture into a food processor or a mixer with a standing bowl fitted with a metal blade and process for 1 minute with the feed tube open [if using the food processor]. With the motor running, add the cold cream. Add the cut cream cheese and process for about 30 seconds, scraping the sides if necessary or until smoothly incorporated. Add the eggs and process for about 5 seconds or until just incorporated [do not overmix!]. Set the cake pan in a large roasting pan. Pour the batter into the cooled crust and pour enough boiling water into the large roasting pan to come up about halfway to the cake pan. Bake at 325 degrees until the cheesecake is set, about 1 1/2 hours. If it jiggles, it’s not done. With my oven, it took me about an hour and 45 minutes. Carefully remove the roasting pan from the oven and set on a wire rack. Using a paring knife to loosen the cake from the sides of the pan. Cool until the water is just warm, about 45 minutes. Remove the springform pan from the water bath, remove the foil and set on a wire rack. Continue to cool at room temperature until barely warm, about 3 hours. Cover with plastic wrap and refrigerate until chilled, at least 4 hours or overnight. When ready to serve, remove the outer ring from the springform pan. Slide a metal spatula between the crust and pan bottom to loosen, then slide the cheesecake onto a serving platter. Let the cheesecake stand at room temperature for 30 minutes, then cut into wedges. Top with Salted Caramel Sauce [I used jarred] and a dollop of Bourbon Whipped Cream.